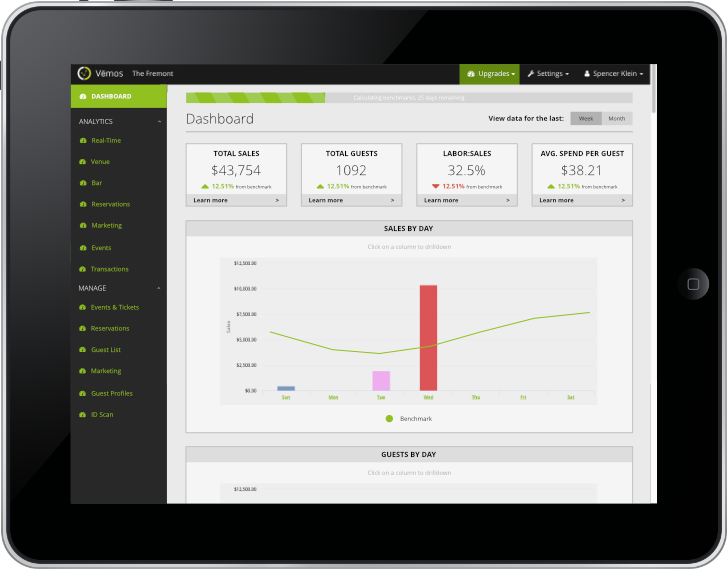 Turn your POS sales data into visual, actionable reports about your venue. Never pull a manual report again. It’s not an efficient use of your time to log into multiple services every night and manually look through spreadsheets to understand your business. We combine data you’re already collecting across your venue into a single, digestible dashboard. That way you only have to log in once to see everything. We go a step further and humanize this data, so you’re presented with a story of your business, who your guests are, and how their actions influence your performance. How do you compare to what you did this time last year? How are you trending based on results last month? Where do you stand against the venue down the street? How about across the country? Easily answer these questions and more. Uncover your benchmarks so you always know where you stand. Use these benchmarks to compare your results against past performance as well as your industry at large. Then use that insight to improve and grow. It’s this mindset that allows our customers from across the world to see increased growth year after year. Is your bar upstairs running slower than normal? Are your cover prices deterring guests from entering? Are you reaching capacity at a rapid rate? Is your average cost per transaction lower than normal? You have the power in your hands to own the night and be in full control of how it plays out. With everything synced, you get real-time information on any device without ever having to refresh your screen. Now, you can make decisions in the moment based on what’s happening right now. Need More Info Before You Try?